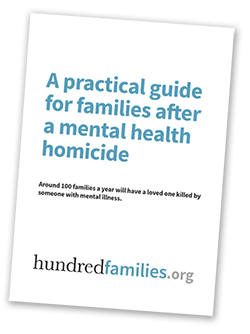 In addition to the individual homicide inquiry reports available here, in May 2008 NHS North East published a review of all local mental health homicides between January 2002 and May 2008. By contrast only 13 cases have been found in press reports for the same period (involving 17 victims). Oct-11 Michell Harrison HMP Frankland Mental Health patient (PD) fatally stabs fellow prisoner History of violence, warned MH nurse he wanted to kill. 25 Jun 2008 Michelle Taylor Walker, Newcastle Mentally ill man fatally stabs ex-wife. Feb 2004 Olive Garvie Jesmond Pensioner MH Homicide. Review, previous violence. Poor teamwork. Aug 2002 Jean Charlton (71) Washington Paranoid Schizophrenic man fatally stabs mother 15 times and attempts to decapitate her. Nov 2001 William Pyle (77) Bishop Auckland Psychotic woman repeatedly batters and stabs father and sets house alight. Sep 2001 Lenny Leak Gateshead Fatally poured petrol over flatmate and lit it during argument. Ind Inq 2004 – history of previous violence. Mar 2001 David Huitson Newcastle Schizophrenic stabbed victim who had given evidence against him in another stabbing case. Ind Inq 2004 – history of previous violence. Jan 2001 John Jeffries Hartlepool MH patient fatally and repeatedly battered victim with rock. Iind Inq 2003 – Previous threats of violence with knives. Jul-95 Jamie Hemy (7 mnths) Wallsend, Tyne &Wear Schizophrenic woman repeatedly stabs baby 70 times. Mar-94 Nickki Conroy (12) Middlesbrough Psychotic man breaks into school and repeatedly and fatally stabs girl.